Monopoly Plus is an online video slot machine game from IGT (International Game Technology) that has been released in July 2012. This online video slot machine game has 5 reels and 30 pay lines. The theme of Monopoly Plus is inspired by the world famous board game Monopoly. Monopoly Plus actually became an instant hit when it was released in 2012, and it was also considered to be the most successful slot launch of the year despite all the classic slots that were released that time. 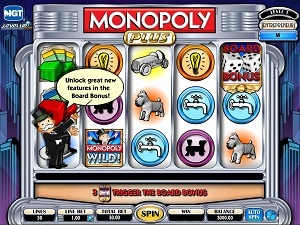 Monopoly Plus brings players a new twist on the Monopoly game with its 5 reels and 30 paylines as well as a unique level-up feature called Level Up Plus which lets the player to permanently increase their payout without interrupting the gameplay. The slot game contains levels, Entrepreneur, Leader, Executive, Luminary, Baron and the last level is the Tycoon. These levels are attained by simply collecting Monopoly money in the Board bonus feature of the slot game. Other board features include the Express Train wherein players are taken to the rich part of the board faster. Hot property enables players to double their mini-slot wins and the Super Tax Relief helps them increase the initial bet to 16,000 times! Other bonus features that can be triggered randomly are Mystery Wild Bonus (that makes fully wild reels), and the Utility Bonus (which creates more chances of rewards)! What’s also great about this is that you can save your status level and accumulated Monopoly money for your next game! You can play online slot games powered by IGT absolutely for free, without the hassle of downloading anything! Monopoly Plus online video slot game is totally a fun and enjoyable game to play at, especially if you loved earning assets, investing into hotels and houses on prestigious areas, and beating others in the Monopoly board game. Most people who play this slot game agree that it brings back great childhood memories of playing the board game with their family and friends. Monopoly Plus features a wild symbol, a scatter symbol, a Mystery Wild bonus feature, a maximum jackpot win of 25,000 credits, a Monopoly Plus Board Bonus Feature (which contains a Property Bonus, Utility Bonus, Chance/Community chest Bonus, Railroad Bonus, Free Parking Bonus, Go to Jail Bonus, Jail Bonus, Go Bonus, Income Tax, Super Tax, or Just Visiting, Rolling Doubles), the Level Up Plus Feature, and last but not least, it has a 94.03% to 96.71% payout ratio! With all these exciting features, Monopoly Plus is truly a slot game that has lots of “plus” points that gives you more chances of bagging that cash money! IGT is considered as the biggest land-based slots manufacturer in the world, so it is not surprising that they are terrific in creating and designing great graphics and using sound effects that perfectly complements each and every specific theme of their slots games. In Monopoly Plus online video slot game, the symbols used in the game are pretty much like what were used in the Monopoly board game. The graphics are simple yet fantastically designed. The Monopoly logo is placed neatly at the top with tall buildings at the surrounding of the reels. The bottom contains all the buttons. As for the symbols, the game designers used Monopoly-themed symbols such as hotels, houses, railroad, water works, electric company, and tokens such as the dog, car and hat. The background of the reels is a solid white, which makes a clean backdrop for the symbols. Creative and entertaining animated programming is enabled whenever you hit winning combinations. The overall graphic design of Monopoly Plus shows many different colors such as green, blue, peach, orange, purple, black, brown, yellow, red, white, gray and silver. When you spin the reels, jazzy and upbeat background music is played, which actually fits the theme of the slot game. Short and varied celebratory background music will be heard whenever you manage to hit winning combinations in this slot game. In Monopoly Plus online video slot game, there are no card deck symbols available. Instead, the symbols are those used in the actual Monopoly board game such as Hotels, Houses, Railroad, Electric Company, and Water Works as well as the Dog token, Car token and Hat token. The Wild Symbol is Mr. Monopoly himself. Mr. Monopoly (wild symbol) acts as a substitute for all other symbols (except for the scatter symbol) in order to help you form a winning combination. When you are able to get winning combinations with multiple wild symbols on an active pay line, you will be given varying prizes (refer to the Paytable). The Scatter Symbol is the Board Bonus Dice. The Board Bonus Dice scatter symbol only appears on the 1st, 3rd and 5th reels, and it is not required to appear on a line (on an enabled payline) for you to win. If you manage to get 3 Board Bonus Dice scatter symbols (anywhere on the 1st, 3rd and 5th reels simultaneously), you will activate the Monopoly Board Bonus Feature game. Please take note that the Board Bonus Dice scatter symbols do not give out any winnings; however, they enable you to enter and play the Monopoly Board Bonus Feature game. The Monopoly Plus online slots become much more fun and exciting to play because it features different types of Bonus Features! The Mystery Wild Bonus Feature can be triggered after any spin outcome that does not contain a Mr. Monopoly wild symbol on the 1st reel, or a Board Bonus Dice scatter symbol on the 1st, 3rd and 5th reels. When the Mystery Wild Bonus Feature game is triggered, Mr. Monopoly will suddenly come out, hopping from reel to reel until he chooses a reel to turn wild. Mr. Monopoly may possibly turn all 5 reels wild, which can give you a massive payout! After 1 to 5 reels are turned Wild, all winning combinations are calculated and paid based on this new final reel state. No winnings are given prior to this final reel state. When the Mystery Wild Bonus Feature game is over, you are taken back to the main Monopoly Plus online slot game, and the winnings earned from the bonus game is included to the overall balance. By obtaining 3 Board Bonus Dice scatter symbols (anywhere on the 1st, 3rd and 5th reels simultaneously), you will trigger the Monopoly Plus Board Bonus Feature game. Once triggered, you are asked to choose your lucky mover. Your choice of mover will not affect your bonus prize payback. The pays rewarded in the Board Bonus game are multiplied by your bet per line on the spin that triggered the Monopoly Board Bonus Feature game. In the Board Bonus game, Mr. Monopoly will ask you to click the “Roll” button to roll the dice. Your mover starts on the “Go” Square. Your mover moves the number of board spots equal to the total of the dice roll. Rolling doubles gives you an extra dice roll. Rolling doubles 3 times in a row will trigger the Jail Bonus. You get awarded different bonus features on the Board Bonus game. *Property Bonus – If you land on a property, you get 1 spin on a mini-slot machine. Your winnings are determined by the symbols that land on the central pay line. You can win money and even extra dice rolls on the same spin! As you go through the board, the mini-slot machines offer even richer paytables with Wild, 2x Wild and 3x Wild symbols! If you land on a baby blue or brown property, you will spin the level 1 mini-slots; if you land on an orange or purple property, you will spin the level 2 mini-slots; if you land on a red or yellow property, you will spin the level 3 mini-slots; and if you land on a dark blue or green property, you will spin the level 4 mini-slots. *Utility Bonus – If you land on a utility, you get 1 roll of the Utility dice. You get payouts based on the sum of the Utility dice. The bigger the sum, the bigger your bonus prize wins. Roll 2 Dice to determine your award. Obtaining “doubles” also gives you an extra roll in the Monopoly Board Bonus Feature game, but your token will not move based on the dice roll in the Utility Bonus. *Chance/Community Chest Bonus – If you land on Chance or Community Chest, you will get a random card from the corresponding deck. Card attributes include: move your token to a property spot, move your token to a utility spot, move your token to the Go square, extra roll awards, money awards, or send you straight to the Jail Bonus. *Free Parking Bonus – If you land on a Free Parking square, you get an extra roll on the Board Bonus. *Railroad Bonus – If you land on a railroad, your token goes to the next railroad spot on the Board Bonus, plus you get an extra roll! *Go To Jail Bonus – If you land on the Go To Jail square, your token will be taken to Jail, and the Jail Bonus begins. You do not Pass GO or Collect the GO award when this happens. *Go Bonus – If you land on or pass the GO, you are rewarded 200x your triggering line bet! You will not be given this bonus prize if your token is sent to the Jail Bonus. *Income Tax, Super Tax, or Just Visiting – If you land on Income Tax, Super Tax, or Just Visiting, you will not be given bonus prize awards. *Jail Bonus – In the Jail Bonus, you have 3 tries to roll doubles. If you roll doubles once in the 3 tries, you get out of Jail and you’re given a special prize. You win a bonus prize award of 300x your line bet if you roll doubles once in 3 tries. You will not get an extra roll when you roll doubles in the Jail Bonus. After Jail Bonus, the game play continues from the Jail square if you still have rolls remaining. Please take note that your token is not moved by any of your dice rolls in the Jail Bonus. *Rolling Doubles – Rolling doubles gives you an extra roll. When you roll doubles 3 times in a row, you will be sent to the Jail Bonus. Please take note that the Board Bonus is limited to a total of 50 rolls only. When the Monopoly Board Bonus Feature game is over, you are taken back to the main Monopoly Plus online slot game, and your winnings from the bonus game are included to your overall balance. When the Monopoly Board Bonus Feature game is triggered, you receive Monopoly Money when: you trigger the Board bonus, you land on a property, you land on a utility, you land on or passing GO, or you land on Income Tax, Just Visiting, or Super Tax. You get more Monopoly Money for landing on properties on the richest sides of the board. The Monopoly Money you get continues across play sessions and carries over from game to game. The Monopoly Money meter that is located on the top left corner of the Monopoly Board Bonus Feature game (or on the first page of the Paytable), displays your Monopoly Money balance as well as the percentage of completion up until you reach the next level. When your Monopoly Money balance reaches certain points, you “Level Up”. When you Level Up, you get a new title and you immediately unlock either new Monopoly Board Bonus Features or new player movers. Also, the amount of Monopoly Money you earn when you land on properties is boosted as you Level Up! Entrepreneur You begin on this level. • Every time you’re in the Board Bonus, 2 randomly chosen properties become Hot Properties for that Board Bonus game. • The Hot Property is marked with a golden 2x. • All cash prizes won on a Hot Property are doubled! • The Super Tax spot becomes Super Tax Relief. • When you land on the Super Tax Relief, you will spin a special golden slot machine with 4x Wild symbols! • You get a new Chance card that sends your mover straight to the Super Tax Relief. Monopoly Plus has 5 reels where you can bet on as many as 30 pay lines. The minimum bet is 0.01 and the maximum bet is 10.00 per line. You can wager only 1 coin per pay line bet. Since betting is fixed at 30 pay lines, the minimum bet amount is 0.30 and the maximum bet amount is 300.00 per spin. It is absolutely more fun and easy when there is an Auto Spin function available in online slot games. In Monopoly Plus, you can access their Auto Spin function by clicking on the Auto Spin button on the lower right corner of the screen. You are given the choice of how many spins you would like the game to do automatically for you – from as low as 10 up to as high as 50 Auto spins. When you choose a number, say 10, the Auto spin will keep track of the remaining number of auto spins. The Auto Spin will stop only when a Bonus is triggered or the balance is insufficient to spin again. Also, you are actually given the option to stop the Auto Spin yourself, just in case you want to. « More slotmachines guides Article last updated: Thursday, January 16, 2014.